Fresca is pleased to usher in a new age of customization with the introduction of its Torino line. The frosted glass panels of the doors balance out the sleek and modern lines of Torino, making it fit perfectly in either 'Town' or 'Country' decor. Available in the rich finishes of Espresso, Glossy White, Light Oak and Walnut Brown, all of the vanities in the Torino line come with either a ceramic vessel bowl or the option of a sleek modern ceramic integrated sink. 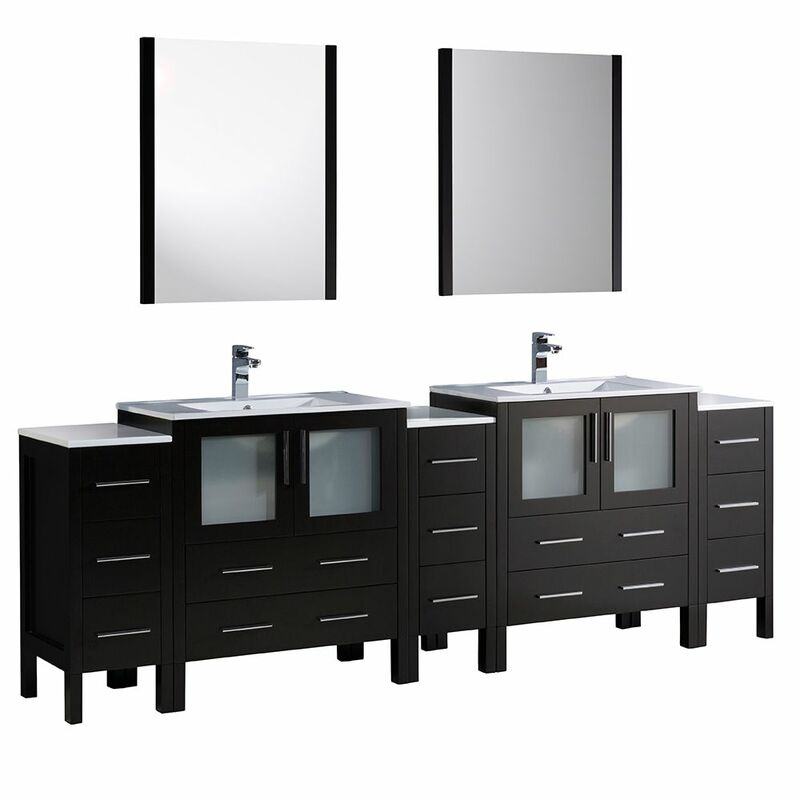 This modern 96 inch double sink bathroom vanity set with ceramic vanity top is a perfect combination of elegance and value. The soft-closing doors and drawers add another touch of class. The vanity set includes the vanity, sink, top, mirror and cabinet hardware. Torino 96-inch W Double Vanity in Espresso with 3 Side Cabinets and Integrated Sinks Fresca is pleased to usher in a new age of customization with the introduction of its Torino line. The frosted glass panels of the doors balance out the sleek and modern lines of Torino, making it fit perfectly in either Town or Country dicor. Available in the rich finishes of Espresso, Glossy White, Light Oak and Gray Oak, all of the vanities in the Torino line come with either a ceramic vessel bowl or the option of a sleek modern ceramic integrated sink.